This Extra Large Unglazed Egyptian Clay Bowl resembles the Traditional type of Egyptian Clay Bowl that has been used to smoke Flavored Tobacco for centuries. This unglazed clay bowl is very sturdy, and will most likely fit on any type of Hookah. Unglazed bowls are preferred by Hookah smokers who are looking to enhance their smoking experience by designating onebowl for a one flavor in particular. The benefit to it being unglazed is that it allows the juices and flavoring to absorb into the clay, ghosting the bowl, and boosting the flavor strength each session. If you want to enhance it even further, couple it with an unwashable leather hose and dedicate it to the same flavor. Just keep in mind, if you mix flavors with either it will not perform the same. 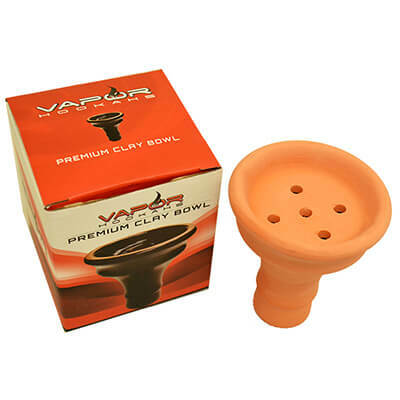 The Extra Large Unglazed Egyptian Clay Bowl can hold approximately 20 grams of Flavored Tobacco.